According to Persistence Market Research, the global cardiac arrhythmia monitoring devices market is expected to grow at a robust rate and reach a significant market value by the end of the assessment period. The cardiac arrhythmia monitoring devices market has been witnessing an upward growth graph since past years. 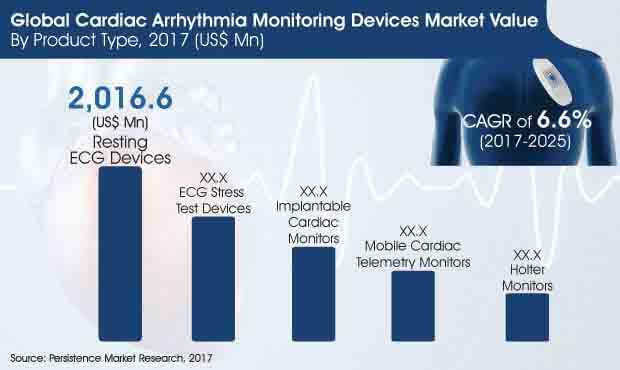 The global market for cardiac arrhythmia monitoring devices market is expected to grow at a stellar CAGR of 6.6% throughout the period of forecast. It is estimated to reflect a high valuation of above US$ 8500 Mn by the end of the year of assessment from a value a little above US$ 5 Bn in 2017. Factors pushing the growth of the global cardiac arrhythmia monitoring devices market include advancements in cardiac arrhythmia monitoring devices, favorable reimbursements for cardiac disorder treatment, increasing incidences of cardiovascular diseases, growing focus on containment of healthcare costs, increasing adoption rate of low cost ECG services among lower income group and favorable government policies for startup companies. Countries in the Asia pacific region, such as China and India, are the hotspots for investment opportunities because of higher growth rate of diagnosis, treatment and research activities, quality improvisations, increasing number of partnerships and healthcare modernization. To increase the revenue share, EGC monitoring device manufacturing companies are focusing on the development of advanced ECG monitoring devices such as, cardiac telemetry monitors and implantable cardiac monitors with advanced facilities, that will indirectly pump the demand of cardiac arrhythmia monitoring devices and also boost the services and software market over the forecast period. Increasing demand for high end, advanced ECG monitoring devices from end users, such as hospitals, ambulatory surgical centers, diagnostics centers, homecare settings and emergency medical services for better output and performance, will generate opportunities for launching of novel ECG monitoring devices in the market in the long run. Use of ECG monitoring devices and services has skyrocketed over the past decade. ECG has penetrated into different departments owing to its extensive use in mobile cardiac outpatient telemetry and currently in data management for electronic medical records (EMR). The growing number of life threatening cardiac diseases has led to a threefold increase in the demand for ECG monitoring devices and services in hospitals and diagnostics laboratories with the necessary and advanced software services. The aforesaid factors will increase the demand for ECG monitoring devices, data management and services in large integrated healthcare systems. Resting ECG device detects arrhythmias while the patient is in resting position. Resting ECG devices are mostly used at hospitals and cardiology clinics. Resting ECG devices segment in the product type category dominated the global market during 2012-2016 timeline and is likely to retain its status quo in the coming years. The resting ECG devices segment is estimated to reach a market valuation of more than US$ 2.8 Bn by the end of the year of assessment from a value of about US$ 2 Bn in 2017. The segment however reflects a comparatively slow pace and is expected to grow at a CAGR of 4.6% during the period of forecast. Holter monitor is a portable ECG device, which can be worn by the patient in order to record the patient’s heart activity continuously for a certain period. They are able to record data for longer periods and transfer the same to doctors for analysis. Cardiac telemetry monitoring devices monitor the electrical activity in your heart for an extended time. The device can detect, record and wirelessly transmit asymptomatic and symptomatic arrhythmia to a monitoring station for analysis. Holter monitors and mobile cardiac telemetry monitors segments in product type category are expected to reflect a similar growth rate throughout the period of forecast, 2017-2025. However, the mobile cardiac telemetry monitors segment is estimated to hold higher market share than holter monitor segment and is poised to reflect a value above US$ 1500 Mn by 2025 end.